OK, this post is belated: Earth Day was a week ago on 4.22.08. I apologize for skipping last week's posts. 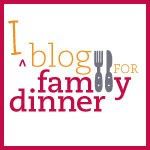 I got busy with a work project that is pretty much the diametric opposite of "eat dinner with your family" (the blog) and I couldn't keep up. I'm glad to say that we were still actually able to "eat dinner as a family" (the reality) through the last few busy weeks. But extra writing? No, couldn't swing it. Every day should be Earth Day anyway, and spring is definitely in the air. As any gardener knows, spring leads to thoughts of growing and what better than to grow you own dinner, or some part of it, anyway? I am lucky enough to have a small brownstone garden in Brooklyn, but it is shady and has next to no sun. This is a bad thing for vegetables. Many years ago I could grow tomatoes, but more of the neighbor's trees have grown in and new buildings have sprouted up in vacant lots. Those days of 6 or more hours of sun hitting my yard are long gone. Still, like any gardener, I try and I hope. The main thing I grow is herbs in window boxes from my porch. It makes it easy to get a few snips of fresh herbs when I'm cooking in the kitchen. This year I plan to plant 6-8 kinds of herbs, which would be a record. You can buy herbs now and plant them and start taking small trimmings right away. Once established, the more you use you herbs, the bushier and healthier they will grow. If you've never tried vegetable gardening, you can start small. Containers work really well for cherry tomatoes and other vine vegetables. You can use a long stick and string to encourage the plant to grow upwards. (Here's a how-to link.) The Brooklyn Botanic Garden is selling a "salad mix" window box this year that sounds intriguing and easy. Also, if squirrels are a problem, you can cover the container with mesh. Covering a few pots is a little easier than trying to cover a large garden plot. If you can't grow your own, now is the time to consider joining a CSA (Community-supported agriculture) for produce in the early summer through late fall. Find out more about CSAs from Just Food. Or join or visit a community garden. Even if you never grow anything, there is something wonderful about enjoying a garden in the middle of the city. Kitchen Gardening from BBG: Info on edible plants and herbs from the "new American kitchen." If you have a specific gardening interest, the BBG book series is great. You can order individual books on gardening topics that interest you online.